Expand your visibility. Showcase your work. Your organization’s profile is the main way for users to connect with you. Share your mission, vision, and key information with cause-minded individuals who are looking for ways to get involved with nonprofits. Optimize your profile’s searchability by utilizing all the features available to you. Profile: Users find out about who you are, what you do, and how they can get involved in your work on your profile page. Activity: View and keep track of all ongoing projects and events on your Activity page. Events: With PWI Events, you can advertise your upcoming events, sell tickets, and keep attendees in the loop with updated information. Storyteller: Ask your volunteers and supporters questions about their experience and receive their responses in the form of photos and videos. 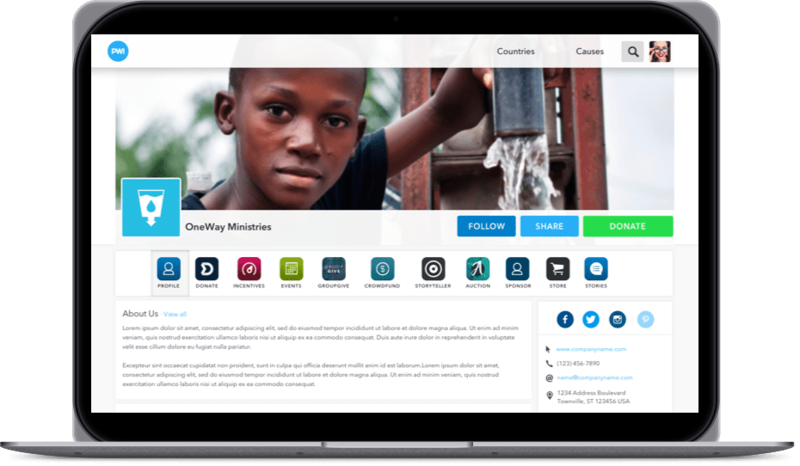 Stories PWI Stories is a blog channel that allows you to tell your supporters about specific experiences that highlight the impact you’re making in the world. On your PWI profile, you can connect with new users and provide your existing supporters with a central place to engage with your work. Donations: After reading about the work you do, any user can donate directly to your organization. We don’t take any percentage of donations made on our site because our first priority is helping you, our nonprofits. 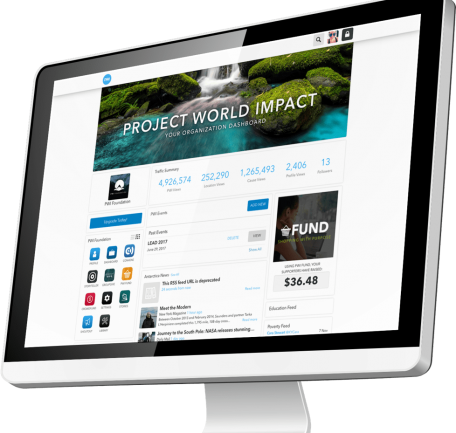 Crowdfund: Crowdfunding projects allow you to raise money for specific areas of need and give your donors the opportunity to see exactly where their money is going. Store: Your Store page is another platform for you to connect with supporters and sell the products that represent the work you’re doing. GroupGive: Your supporters can involve their family and friends in your cause when they create peer-to-peer fundraising projects, and everything they raise goes directly to you. Auction: Manage and execute your next live auction all from the Auction page of your PWI profile, allowing supporters to participate from wherever they are. Connect with people who are already passionate about the kind of work you do. Provide the most innovative ways for your supporters to donate. Keep 100% of the money that you raise through PWI. Grow your network and get your work in front of 1 million visitors per month.